Platform lifts come in all shapes and sizes. In this blog, we walk you through the different types of platform lift available and the differences between them, outlining the advantages of each and the environments in which they are most suitable. The options can be endless (and confusing!) when it comes to vertical platform lifts. The Machinery Directive, which governs disabled platform lifts, can throw up a lot of choices but these types of lift can be grouped into five broad categories. Low speed lifts Also called low pit lifts, these are wall-mounted or structure-supported lifts that have the look and feel of a traditional passenger lift, with the same doors, cabin and operation, but travel at a reduced speed. Cabin lifts These lifts are built in a structure, with passengers travelling in a cabin with walls, a floor and a ceiling to give it a more enclosed feel with the lift operation being one-touch. Enclosed platform lifts These lifts are in a structure with a moving platform and control panel moving up inside the structure. The lift operation used here is constant pressure. platform lifts Typically used over short lengths of travel these lifts vertically move the user(s) on a guarded platform from one level to another. Wheelchair platform stairlifts Also called inclined platform lifts, these lifts have a platform that follows the curve of the stairs and are only suitable for one user. All these access lifts provide disabled access in low-rise buildings where a passenger lift is not available (or it is impractical to install one), and are based on the number of people you want to move and the travel distance. 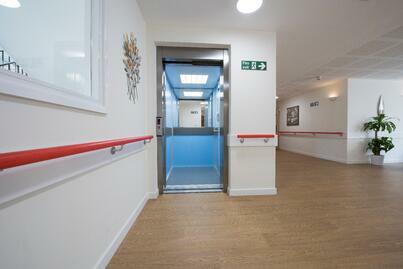 These lifts can also be used for passengers with buggies and luggage, subject to weight limits. For further information on the building regulations and differencess between platform and passenger lifts take a look at our 'Building Regulations - Do I Need A Lift' Blog. What is a low speed passenger lift? 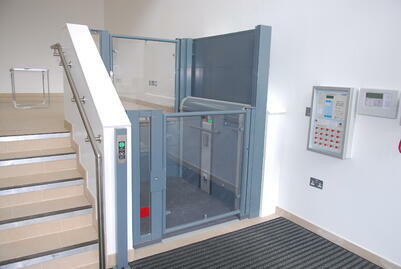 These lifts are a hybrid between a passenger and a platform lift, that fall under the Machinery Directive. Benefits include the similarity to passenger lifts, with automatic buttons, automatic car and sliding doors. All these features make the lift easier to use and more appealing, with no encroachment onto landings. Once inside, the lift user does not see the moving walls of the structure (as they do in other Machinery Directive lifts) and there is greater opportunity to make the finishes within the lift car unique. These lifts tend to be smaller than passenger lifts, carrying up to 5 persons and are therefore most suitable for low-rise, low usage applications. At Stannah, we call this lift the Piccolo. What is a cabin platform lift? Cabin lifts include cabin walls, a ceiling, and a “virtual” or physical cabin door on sides with an entrance and exit. 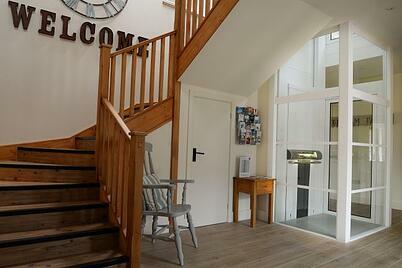 Built within a structure, the lift is effectively enclosed . Automatic controls come as standard, rather than constant pressure (or hold to run) controls that are found on a conventional platform lift. The automatic controls mean the lift operates in a similar way to a passenger lift, and does not require the user to continuously press and hold a button while travelling. A cabin platform lift is designed to provide vertical movement between floors in a low rise building (typically up to five floors). At Stannah, we call this the Midilift Plus. What is an enclosed platform lift? An enclosed platform lift is a platform that moves within an enclosure, operated by continuous pressure push buttons. 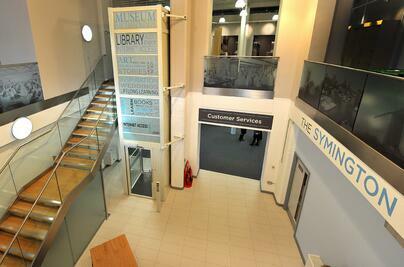 As you travel in the lift you see the inside of the structure as the lifts goes up or down. These lifts typically serve up to two or three floors. At Stannah, we call this type of lift the Midilift. While some conventional platform lifts are marketed as capable of serving up to six floors and/or 12m or more, we would recommend no more than four floors as a platform lift travelling 12m would take 80 seconds or more to go from top to bottom, which is a long time for the user to hold the button. Especially if this person is elderly and/or easily fatigued. What is an open platform lift? Open or non-enclosed lifting platforms (sometimes called steplifts) vertically move the user(s) on a guarded platform from one level to another. These types of lifts are best where there is a small change in floor level or a mezzanine level and are most often used in places where it is either not possible or not practical to provide a ramp. These lifting platforms are operated by continuous pressure push buttons. At Stannah, we call this type of lift a Lowriser. What is a wheelchair platform stairlift? Other options include a Stairiser SR (a straight rail wheelchair stairlift), or a Stairiser CR (the curved rail equivalent). These inclined wheelchair lifts, are a platform mounted on a rail, that follows the contours of the stairs. The Stairiser can be operated by either the wheelchair (or seated user) or a nearby attendant. These wheelchair platform lifts are typically applied in buildings where a passenger or vertical platform lift cannot be installed. When it comes to standards and regulations, all of the platform lifts listed above fall under the Machinery Directive and therefore operate at a speed of 0.15m/s or less. However, due to the contrasting designs and speed of travel etc. they fall under slightly different British Standards. Enclosed vertical lifting platforms should conform to BS EN-81-41. *There is work underway for a new standard to cover low speed and cabin platform lifts, however it is at early stages. Stannah is involved in the development of this standard and will update on it in due course. Hopefully, by now you are aware of the different types of platform lifts available when searching for the perfect access solution for your building. One of the most important things to consider is the builders work that will be required for each choice of lift and how this matches up to your building. Our infographic covers everything you need to differentiate between our vertical lifts range, enabling easy comparison between product specifications (capacities, travel, pits and headroom) and building requirements (typical installation times, electrical and builder’s work requirements). Stannah can supply you with any of the products mentioned above, so feel free to look through our platform lift range for further visuals, case studies and to download technical information.